The financial markets are now rapidly running out of liquidity. The Fed will withdraw $50 billion in liquidity from the financial system this month via its Quantitative Tightening, QT, program. This is the largest liquidity withdrawal since the 2008 crisis. The Fed is not the only one. The ECB will halve its QE program to just €15 billion per month: its smallest liquidity pump since it initiated its QE program in January 2015. The Bank of Japan, is ALSO halving its QE program for long duration bonds this month. Put simply, the three most important Central Banks are either actively withdrawing liquidity from the system (the Fed) or rapidly cutting their liquidity pumps (the ECB and BoJ). October will mark the lowest amount of Central Bank liquidity hitting the system in nearly FIVE years. Small wonder then that the bond market is starting to blow up, as the single largest buyer of sovereign bonds (Central Banks) shift from net buyers to net SELLERS of debt. 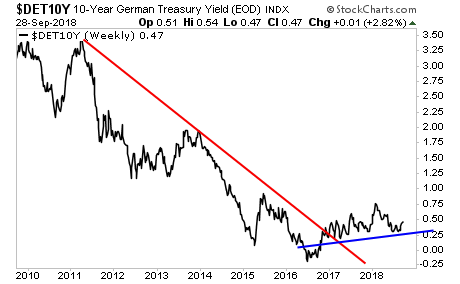 Yields on Germany’s 10-Year Bunds are breaking out. So are yields on Japan’s 10-Year Government bonds. 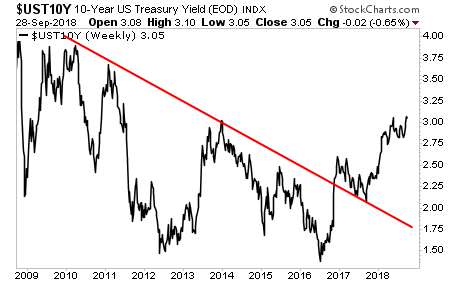 And worst of all, yields on the all-important 10-Year US Treasury bond are breaking their multi-decade downtrend. Again, this is a MASSIVE deal. 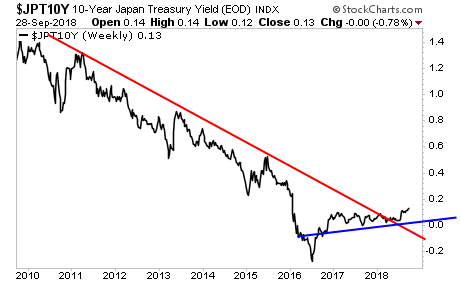 And while 99% of investors are focusing on stocks… it is BONDS that are flashing a major warning.